A brief (over)look at ClamAV security and performance. Comparing Open Source Antivirus products with commercial products. I've been looking into signature based open source security products lately, namely Antivirus software (for SMTP E-Mail gateways or File Servers or anything that would be used as a distribution point for example as well as for Desktop systems). I've had a pretty good look at ClamAV and other ClamAV based products (ClamWin or Spyware Terminator which include the ClamAV Engine) and found them rather weak, both from a security point of view (vulnerabilities) and in terms of detection rates, as well as performance (speed) and usability (interface, features, etc). Clam AntiVirus (ClamAV) is an open source (GPL) anti-virus toolkit for UNIX (also ported to Windows, and used by GUI products such as ClamWin) designed especially for e-mail scanning on mail gateways. It provides a number of utilities including a flexible and scalable multi-threaded daemon, a command line scanner and advanced tool for automatic database updates. The core of the package is an anti-virus engine available in a form of shared library. So let's compare that with another security product, Avira Antivir, basically multi-platform Antivirus software (also has a free version for non-commercial usage). 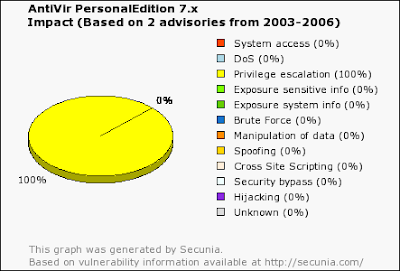 We can see only 2 security vulnerabilities reported, both local and privilege escalation (Windows only too). Vulnerabilities range from Denial of Service: "A NULL-pointer dereference error exists within the "cli_scanrtf()" function in libclamav/rtf.c. This can potentially be exploited to crash ClamAV via a specially crafted RTF file." to Buffer Overflow and System Access: "An integer overflow error in rebuildpe.c when rebuilding PE files after unpacking can be exploited to cause a heap-based buffer overflow via a specially crafted executable. Successful exploitation of this vulnerability may allow execution of arbitrary code." What about a source code audit of ClamAV? Well, I don't really have the time for that, but I did parse it through Flawfinder, RATS and other Static Code Analysis tools looking for simple lexical "bad practices" and functions (strings functions for example) that may overflow buffers and so on. Extra care should be taken to ensure that character arrays that are allocated on the stack are used safely. They are prime targets for buffer overflow attacks. Check to be sure that the non-constant format string passed as argument 2 to this function call does not come from an untrusted source that could have added formatting characters that the code is not prepared to handle. Check to be sure that the format string passed as argument 2 to this function call does not come from an untrusted source that could have added formatting characters that the code is not prepared to handle. Additionally, the format string could contain `%s' without precision that could result in a buffer overflow. Argument 1 to this function call should be checked to ensure that it does not come from an untrusted source without first verifying that it contains nothing dangerous. Environment variables are highly untrustable input. They may be of any length, and contain any data. Do not make any assumptions regarding content or length. If at all possible avoid using them, and if it is necessary, sanitize them and truncate them to a reasonable length. umask() can easily be used to create files with unsafe priviledges. It should be set to restrictive values. DNS results can easily be forged by an attacker (or arbitrarily set to large values, etc), and should not be trusted. Check to be sure that argument 2 passed to this function call will not copy more data than can be handled, resulting in a buffer overflow. Check to be sure that the non-constant format string passed as argument 1 to this function call does not come from an untrusted source that could have added formatting characters that the code is not prepared to handle. Check to be sure that argument 1 passed to this function call will not copy more data than can be handled, resulting in a buffer overflow. When setting signal handlers, do not use the same function to handle multiple signals. There exists the possibility a race condition will result if 2 or more different signals are sent to the process at nearly the same time. Also, when writing signal handlers, it is best to do as little as possible in them. The best strategy is to use the signal handler to set a flag, that another part of the program tests and performs the appropriate action(s) when it is set. Don't use on memory intended to be secure, because the old structure will not be zeroed out. If the third argument, pDacl, is NULL there is no protection from attack. As an example, an attacker could set a Deny All to Everyone ACE on such an object. Standard random number generators should not be used to generate randomness used for security reasons. For security sensitive randomness a crytographic randomness generator that provides sufficient entropy should be used. the first line where a check has occured. You should keep in mind that ClamAV also relies on 3rd party libraries and tools, and it's security also depends on those. Again, I remind you that these aren't actual vulnerabilities, just bad practices that MAY lead to such vulnerabilities. You would need to look at the code and employ various testing tools to find them. The authors of ClamAV should really solve these problems like OpenBSD developers do, even if it is something as simple as replacing strncat() with strlcat() - functions designed to be safer, more consistent, and less error-prone (this would be an issue on other platforms though, so it's not as simple as that). AV-Test is an anti-virus research project at the Institute of Technical and Business Information Systems at the Otto-von-Guericke University Magdeburg (Germany). ClamAV also scores a 17 % (sig: 99% / heur: 1%) in retrospective Antivirus Performance Statistics, which also placed it among the last. I definitely need to investigate this further, but so far I find ClamAV to be highly overrated, simply based on the fact it is "part of the open source movement". It lacks a real time scanner (that's fair seeing how it was designed for mail gateways though), it has a horrible security track record, poor detection rates and dreadful performance. I somewhat doubt that it would last long as a commercial product. Still, it is available on multiple platforms, and the cost is just about right :-). Things aren't all bad though (and I may have been to rash and only brushed the surface here). ClamAV is a free product (open source even), and it does leave a lot of room an opportunity to evolve. I just don't see this happening without powerful commercial backing. If you plan on using it though, make sure you've got at least another product scanning your emails :-).